We packed up the trailer this morning and headed up I-75 to Knoxville, then on to Pigeon Forge. We arrived here in Pigeon Forge mid-afternoon. 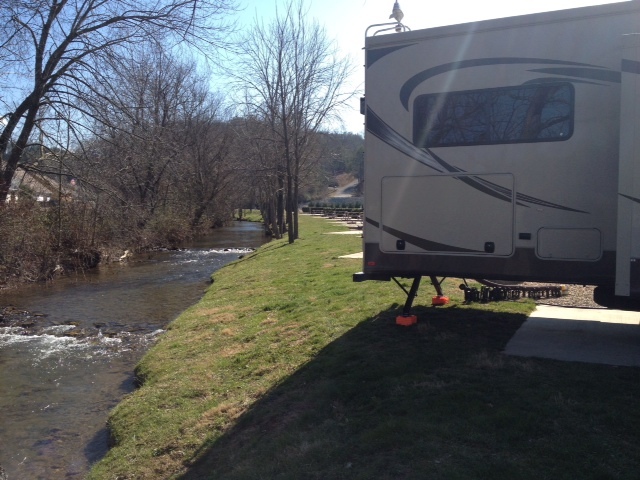 We got a creek side spot in the campground. There is only one other trailer here. I would suspect this isn’t exactly in-season. 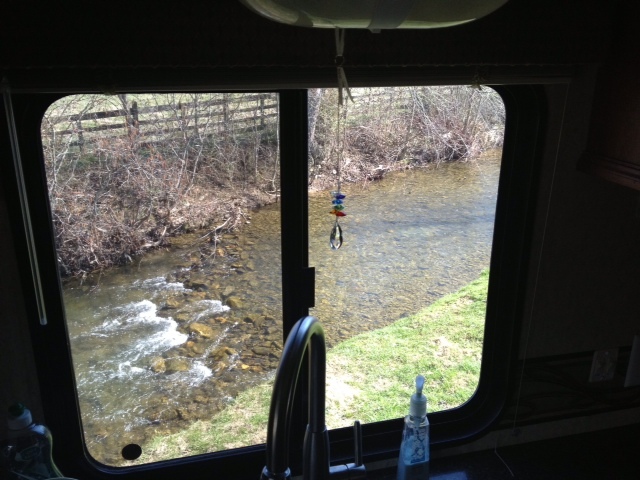 Here are a couple of pictures out back of the trailer. Looking along the creek bank. The little “falls” behind the trailer sound so nice. We’ve left the back window open this evening listening to them. While we were waiting for Val’s sister to arrive this afternoon, we ventured back up the road to a Goodwill that we passed along the way. Val has been scouring Goodwills and thrift shops for knitted and crocheted blankets for the Heartland Owners’ Club give back program called Babies Wrapped in Love that she will be involved with during the summer Heartland Owners’ Club rally in Goshen, Indiana. 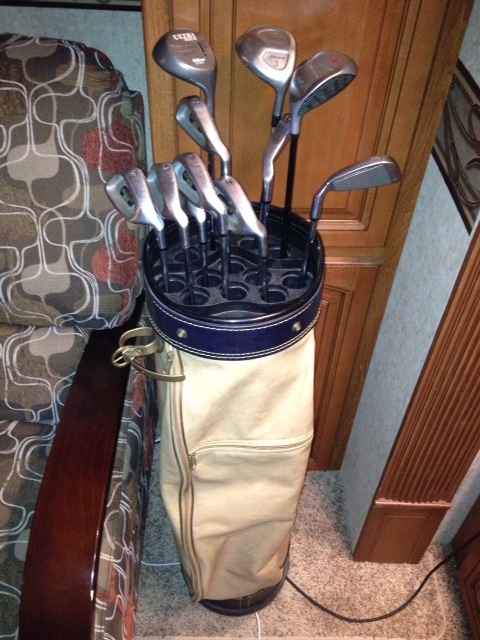 Malcolm decided to get an inexpensive set of golf clubs to try his hand out at the sport again after twenty-some years and has built up a pretty complete set between two Goodwill stores for a total of about $25. Val’s sister, Annie, arrived around dinner time. We gave her the tour of the trailer and got her settled in, then cooked up a big pot of soup for dinner. Later, we watched a movie, then had a Skype video chat with our daughter and grand-daughters. Now, we’re all sitting around on our respective laptops catching up with the world. Tomorrow will probably involve a trip to Gatlinburg to walk around.